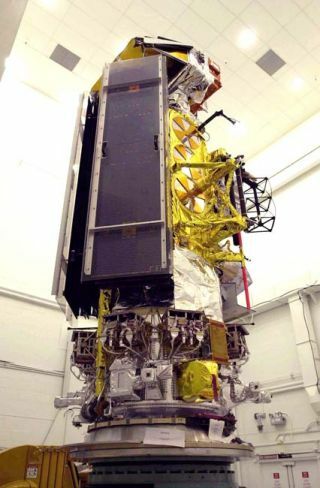 The NOAA-N weather satellite awaits its launch shroud before being attached to its Boeing-built Delta 2 rocket and sent into orbit in a May 11 launch from Vandenberg Air Force Base in California. Takingthe pulse of our planet's health and detecting clues needed for weatherforecasts have been the chief tasks for Earth-orbiting weather observatoriesover the past four decades, and that legacy will be extended this week when thelatest spacecraft blasts off from California on Wednesday. The NOAA-N satellite isslated for liftoff at 1022 GMT (6:22 a.m. EDT; 3:22 a.m. PDT) on May 11 from Space LaunchComplex-2 West at Vandenberg Air Force Base atop a Boeing-built Delta 2 rocket. "When it launches,NOAA-N will not only be our eyes above the Earth, but our eyes into thefuture," said Gregory Withee, assistant administrator for the NOAASatellite and Information Service. "Because it willstrengthen our understanding about what the environment around the world isdoing, not just here in the U.S., NOAA-N will bring us one step closer to trulyglobal coverage of Earth's complex processes," added NOAA AdministratorConrad Lautenbacher, Jr. The 3,130-pound spacecraft-- to be renamed NOAA-18 once safely in orbit -- is the fourth in the currentseries of five Polar Operational Environmental Satellites with improved imagingand atmospheric sounding capabilities that will operate to the end of thisdecade. The program has a heritage that dates back to the dawn of the spaceprogram. After entering servicelater this summer, the Lockheed Martin-made satellite will replace an agingsister-craft, NOAA-16, launched in September 2000, ensuring an uninterruptedflow of data such as imagery, temperature measurements and atmospheric profilesthat are the building blocks of weather forecasts. "Today, satellitesprovide more than 99 percent of the observations used in NOAA's operationalweather and climate prediction numerical model runs. Recognizing that, we can'tunderstate the importance of satellite data in the success of these forecastmodels," said Louis Uccellini, director of the NOAA Centers forEnvironmental Prediction. "Since NOAA-N will beoperational by late summer, it will help us to develop the outlook for theupcoming fall and winter." The satellites also buildlong-term databases for climate monitoring and global change studies. "Data from NOAA'spolar-orbiting satellites are essential to the success of our weather andseasonal forecasts and El Nino and La Nina forecasts," said Uccellini. While meteorologists usethe data gathered by the craft to generate weather predictions, agriculturalscientists need the information for drought management and monitoringvegetation and soil moisture, and the aviation community uses NOAA satellitesto detect and track volcanic ash plumes and re-route aircraft as needed. This newest spacecraftbecomes the catalyst to developing the Global Earth Observation System ofSystems, Withee said. "GEOSS was establishedby an agreement signed by 60 nations just recently, including the United Statesand European Commission. (The program) commits to linking existingenvironmental monitoring technology into one system to better predict a wholehost of issues to the benefit to mankind, including weather, climate andnatural catastrophe," he said. "The challenge beforeus is to connect with scientific dots and technology dots an integrated,international, comprehensive Global Earth Observation System of Systems so thatwe have a complete picture of the global environment. NOAA satellites,including NOAA-N, will play a significant role." Like its predecessors,NOAA-N is fitted with the international Search and Rescue Satellite-AidedTracking System, called COSPAS-SARSAT. Over the past 23 years, spacecraftequipped to hear distress signals from emergency beacons are credited withsaving almost 5,000 people in the United States, and more than 18,000 worldwide. In the first four months of2005, NOAA said 36 people were rescued in the U.S. thanks to the vital linkbetween the satellites and beacons carried by airplanes, boats and hikers. Lastyear, Alaska had the most rescues, with 37, while Florida had 36. "These beacons helpsave lives," Withee said. "As temperatures get warmer, and outdooractivities increase in remote areas -- where cell phones don't work -- havingone of these emergency beacons is a good safety practice." "Beacons remain one ofthe most reliable means of signaling a distress to search and rescuepersonnel," said Lieutenant Commander Jay Dell from the Coast Guard'sOffice of Search and Rescue. "The timeliness and accuracy of SARSAT alertsare extremely valuable to search and rescue planning and response." The weather satellitesdetect a beacon's transmission and alert ground controllers in Suitland,Maryland. From there, the signal is forwarded to a Rescue Coordination Centeroperated by the U.S. Coast Guard for maritime emergencies or the Air Force forland search and rescue situations, according to NOAA. Wednesday's launch willmark the first NOAA weather satellite to ride a Delta 2 rocket into space.Recent spacecraft in the series flew aboard refurbished Titan 2Intercontinental Ballistic Missiles that were originally built to carry nuclearbombs. The Titans lacked thenecessary thrust to deliver the satellites into their 540-mile high orbits. Infact, the Cold War relics deployed the satellites on sub-orbital trajectories,forcing the craft to carry onboard solid-fueled kick motors to generate thecritical final boost to achieve orbit. "There is tremendousbenefit for using the Delta 2 because the Delta 2 is a rocket that wasspecifically designed to deliver a satellite to orbit. That is what we aregetting from the Delta 2. Previously, we launched on rockets that were tryingto deliver weapons," said Karen Halterman, NASA POES project manager atGoddard Space Flight Center. "Once we separatedfrom the Titan, we had to have our own solid rocket motor to fly the satelliteinto orbit. It is risky and excessive. So we believe that the reliability ofNOAA-N is much improved by going to a Delta 2, which is a very proven launchvehicle." NOAA-N is the 119th flightof the workhorse Delta 2 rocket, which debuted in 1989. The booster hasperformed successfully for the past 63 consecutive launches since 1997 and 116times overall in its history. The construction of NOAAweather satellites, getting them launched into space and performing the initialon-orbit checkout falls under NASA's responsibility. Control of the spacecraftis handed from the civilian space agency to NOAA about three weeks afterliftoff. The NOAA-N mission isvalued at $341 million, which includes $160 million for the satellitestructure, $71 million for the instruments and $65 million for the Delta 2rocket. You can follow Wednesday'searly morning countdown and the ascent to orbit in our live Mission StatusCenter.